Fair isle accessories, scarves in particular, can be problematic. I tend to make most of my scarves in the 64-72 inch length after blocking, lining them would result in a very heavy scarf. Knit has a tendency to curl to the purl side in length, and toward the knit top and bottom. Rayon chenille is a customer favorite, knitting it double bed in any DBJ variant is nearly impossible on my E 6000 because of shedding and electronic eye reading errors (I would consider ladder DBJ), and I was left with finding a short float pattern that might look acceptable on its reverse, and lie flat. 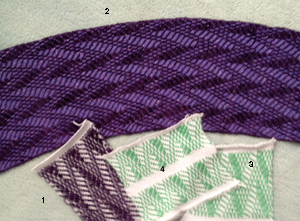 Weaving draft charts can be a great source for repeats for geometric FI knitting. The pattern used below is an adaptation of one. The first swatch (1) looked fine. The long one followed it. When I ironed it however, I noticed not only a missing black square or 2 in my mylar repeat (hidden by the fuzz of the chenille in the first swatch), but how lovely to have a totally curved, far longer edge (if only that was what I wanted)! On analyzing the possible cause I noticed the repeat had many more stitches knit in the chenille than the wool along that edge. Back to the drawing board: the repeat was sorted out using high contrast, smooth yarns (3 and 4), and the pattern was adjusted to a different location on the needle bed. Then, I thought I might introduce a border. The chenille is thicker than the wool, so any hem or stocking stitch edge was too wide. I would have preferred to chain behind the knit to help flatten the bottom and top edges, and ran into yarn breakage galore. The final piece was made using 1X1 FI in the chenille “solid” color stripe to keep a balanced width and fabric thickness, and cast on and bound off edges were rehung and “bound off” again, to help cut down on their rolling toward the knit. 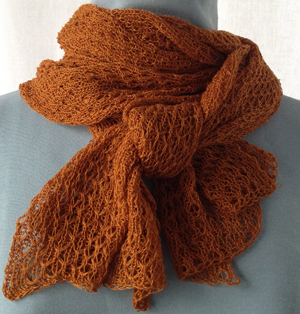 The finished scarf measures 8″X69″, both knit and purl sides are shown below, side edge lengths now match. Assuming one uses a crochet cast on and binds off around gate pegs at the top, a chain is created at both ends, akin to that created in crochet, and one can idetntify a front loop, a back loop, and the whole chain. 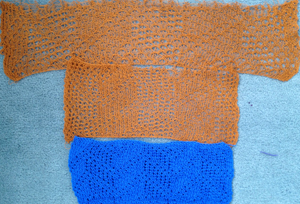 Any of the 3 may be “rehung” onto the KM, and the options are to knit a row and bind off again, or simply bind off again, for different looks that start to emulate single crochet a bit and can help stabilize edges or decorate them.It is helpful to keep notes as to sequence used and which side is facing with each re hanging. Audrey Palmer at one point authored the Empisal book of linked edgings ISBN 0969485905. Intended for use with the empisal (later = Studio) linker, there are lots of interesting uses for combinations of essentially find off techniques, and some resurfaced when she published her books on knit weaving.